BILDER-1600x1200-0677, originally uploaded by rsepulveda. BILDER-1600x1200-0646, originally uploaded by rsepulveda. looking at old pictures tonight. On the left is my great grand father, Max Hannig Ulriksen, quite a character. He was an entrepreneur all his life, working with model planes (why do I like flying ? ), photography (I have a business plan from him for a business in photography! ), athletics including rowing, industrial machinery (stuff around steel)... His father was also an entrepreneur in the thermal water business, made a fortune, and then lost all of it in government bonds in WWI. His father Stanislaus, my great great grandfather, was born in what is now Poland, but Oriental Prussia back then. 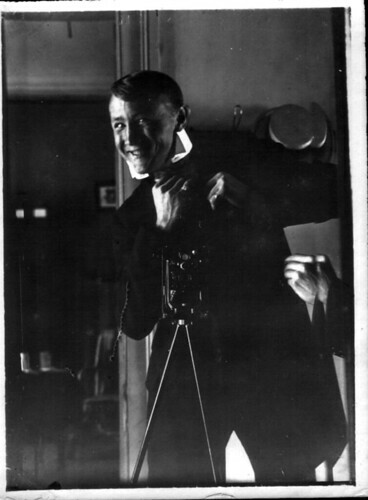 Here we see Max in c. 1917 in his military service in Chile. Their uniform was modeled after the Prussian one, with the typical helmet. 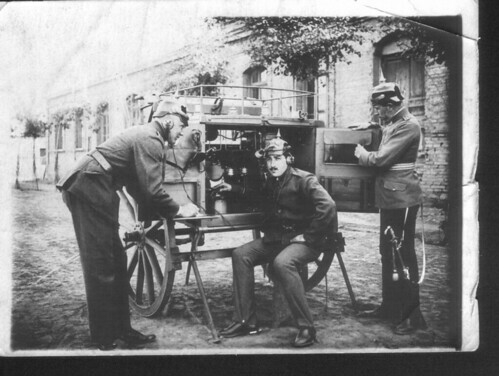 This is the Telegraph Batallion... 90 years later, I deal with telecoms in the Internet space ! You've probably been following my recent issues with Facebook thinking I was spamming other FB users. Whatever. 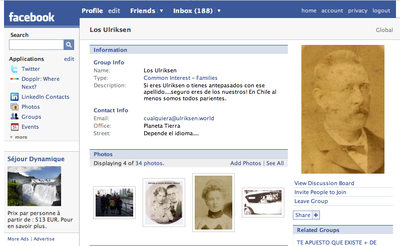 I've however discovered that Facebook is a VERY useful application for genealogy, not perfect, but useful. 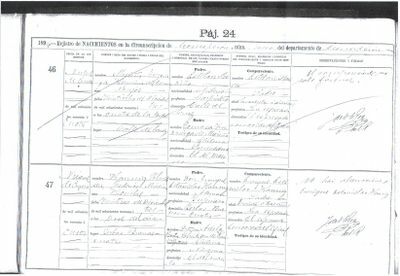 Indeed, most genealogy tools allow you to work with data from over a 100 years ago. That's good when you are researching with ancestors. However for working with contemporary kins, I had not found anything better than the phone book. MyHeritage tried to bridge that gap, helping you get in touch with other people by comparing last names (rarely useful) and pictures with automated tools (not many people upload pictures, so not very useful). I was lucky many years ago to meet a remote cousin of my grand mother who gave me lots of data on the family. I expanded his research into contemporary kins, and have updated it quite a bit. Nevertheless I was stuck with many loose ends, with people bearing names very different to my surnames. 2) we've created groups on Facebook (a bit tedious when a. some people belong to many same surnames, b. when you need to tell a new member to subscribe to a new name). On one group, we are already 41 people in 3 days. Most of us have never met in person, or hardly new each other before. Of course these groups now allow us to exchange pictures, videos, news about the family, which is really nice. I had written about it a while ago, when commenting on Geni. This might work. 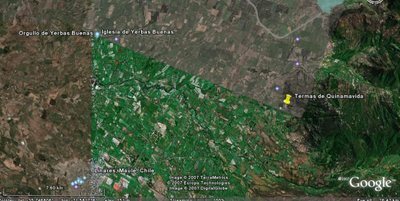 Just browsing the world on Google Earth, as I received tonight by email, a scan of the birth certificate of my great grand father, Max HANNIG ULRIKSEN. The certificate said: born in Yerbas Buenas, way too far from Concepcion, where he was registered. Hum... an error ? 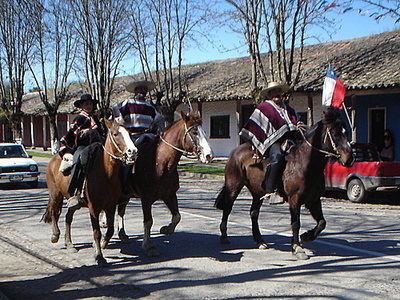 The picture above show 'huasos', chilean cow-boys... wearing the Chilean national costume in Yerbas Buenas. Just a post to mention that today is our National Day in Chile, September 18th. Time to eat Empanadas and drink tinto ! My online family tree has now more than 18,000 members in it. I'm also part of the Roglo database, soon approaching the 2m members. 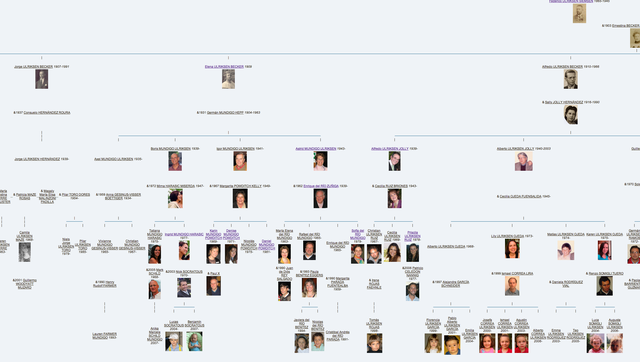 It's getting very difficult for me to keep track of all my family contacts (I use the NOTE field in every person's file, but it's not easily searchable and managable), send them updates about the tree (I use the sepulveda.org blog), or enabling them to subscribe to a ping for an update on any particular branch of the family tree. The Geneweb software I'm using is not allowing it, nor is the service hosting the tree for me. I'm really in the need for a social family network hosted service. Hence I looked again at Geni today. It's interface is very slick and seems to have a lot of the bells & whistles I'm looking for : but after playing with it for a few minutes, there's no appeal. It's not for me. I'm a pro-am genealogist, with many thousand people in my database, meaning I need to manage many different communities (by ancestor mainly), that can interact or not between themselves. I understand the simplicity of Geni for adding new family members (good for rookie genealogists), but in my case, there's no way I'm going to start retyping everything, and although I might look into importing my GEDCOM file to Geni (THIS FEATURE IS NOT AVAILABLE? crazy), I will always maintain it inside geneweb. Hence I need social features added on top on my existing tool.
. pictures of individuals at family reunions. Of course, my guess is that we should start to use video soon as well.
. where they are born, buried, etc. Finally, the one feature I like about LinkedIn is the updated profile features that tells me what my friends are up to. I'd love the same thing on what my family members are up to. There must be a way to create a mashup of all of this. There's an interesting discussion about Geni and all its competitors on Techrunch (mainly based on the valuation, which I don't care much for). 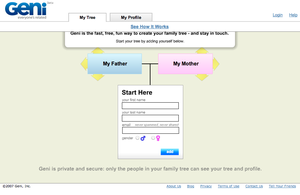 Geni’s family tree builder is really nice but MyFamily.com was the first to realize the market, Amigila.com was the first to build a Flash-based family tree tool. Famiva went limited beta with the viral family tree concept before Geni. Famiva’s Java-applet based animated family network visualizer is also cool, plus it has many features designed to keep families stay current and keep coming back. MyHeritage and KinKafe are also worth a look. And then there’s the flashy Famundo. Geni is not alone in the Family 2.0 space. I haven't tested all the services mentionned above yet (anyone that might help ? ), but I was thinking more about maybe mixing NING or PeopleAggregator with Geneanet. Has anyone done it yet ?
. something that can (OR NOT) be very scalable: at least for me, I see a heavy need, and I would be very much willing to pay for, in the hundreds of euros / year. On my very first search, I found documents relating to my ancestors. Check it out ASAP; afterwards, there will be a fee for these searches. 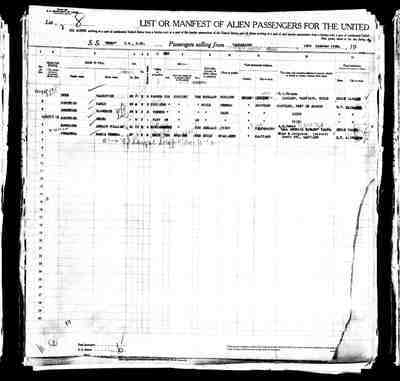 Here's an example of the son of my ancestor Paul Kortwich who emigrated to the USA in 1923. Just updated a lot of choices on this online genealogy platform. The team has added a lot of new features. Well done Christophe. Update: I've also just noticed they've updated the whole design of hosted family trees with their move to geneweb 5.0.